Have you heard about a Solar Balloon? 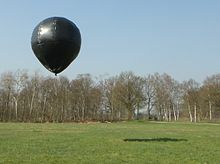 It is a balloon, made up of black colored material, which rises in the air as the air inside it gets heated by the sun. It can be easily made by taping together any black material, something as simple as the domestic black garbage bags. Kids can have fun making it and playing with it outdoors. You can buy one for your kid by clicking here. However, NextPV, the international joint laboratory on PV cells located in Tokyo, has plans of taking this humble solar balloon to greater heights. They are planning a device based on the concept of the solar balloon and combining it with fuel cells. According to them solar though has become cheaper than what it was earlier, is still out of the reach of masses owing to its high cost of installation. Since a majority of the clean source of energy would come from solar in the future, the institute is trying to device these solar balloons in a way that there easy availability of power even during power cuts and night time. A sophisticated energy-generating solar balloon comprises of solar panels and fuel cells, and are meant to be deployed above the clouds. That way, these balloons would function irrespective of a cloud cover in the sky and would continue generating ample amount of electricity. How does a Solar Balloon work? This solar balloon would continue generating electricity during the day with the production of hydrogen. This hydrogen will act as the energy storage medium for generating electricity through the fuel cell. The solar balloon traps solar light with the help of solar panels and generates power throughout the day. The energy is transmitted to the grid points as you can see in the figure below. Part of this sunlight powers the fuel cell, which in turn produces hydrogen. 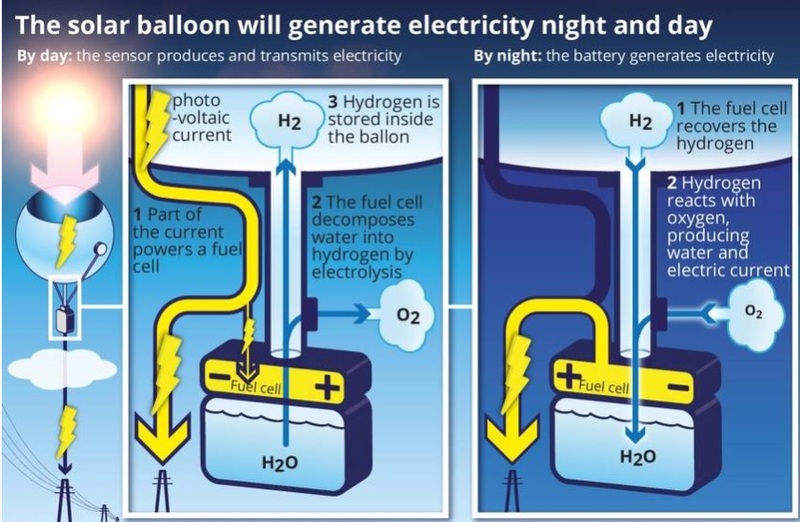 This hydrogen gets stored in the solar balloon. At nightfall, the stored hydrogen and oxygen react in the fuel cell producing water and electricity which is again transmitted to the grid. According to researchers, the energy production could be three times more than a conventional solar system compared on a square-foot basis, as there is no cloud cover, no diffusion, and no other obstruction. The major drawback in the case of a solar balloon is the need for long cables required for transmission and competition with conventional rooftop and utility-scale solar, which are experiencing price cuts each falling year.